We produce a variety of delicious products, including; jams, jellies, fruit butters, mustards and ciders. All fifteen of the Bayfield Apple Company products are made at our orchard from the apples, raspberries, currants, cherries and pears grown on the orchard. The products we craft are distinguished by only using our apples to supply all of the pectin - commercial pectin is not used. Making our own pectin is a time-consuming extra step that our faithful customers admire! We make four delicious varieties of jam: Apple-Raspberry, Apple, Cherry and Blueberry. 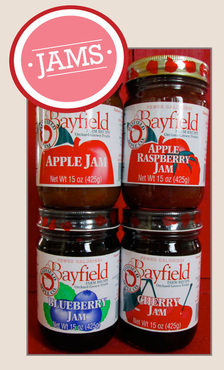 All of our jams have delicious bits of fruit and are the perfect way to get a taste of Bayfield fruit all year long! 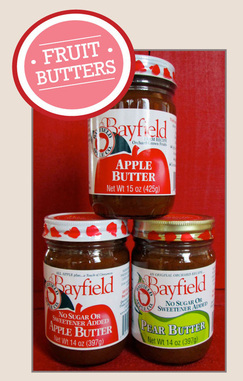 We have three varieties of fruit butters: Apple, Sugar-Free Apple & Sugar-Free Pear. We make our butters by steaming our fruit in the juice of our apples...we think you will like the results! 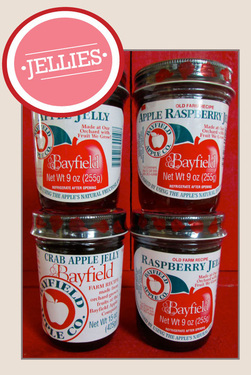 As for our fruit jellies, we make four varieties: Apple, Apple-Raspberry, Crab Apple and Raspberry. Our jellies are made from our fruit juice and our apple pectin. A sweet treat, they are the perfect addition to sandwiches and snacks! Savory and unique, our mustards have such a high fruit content, they can be used not only as a condiment, but as a dip or glaze. 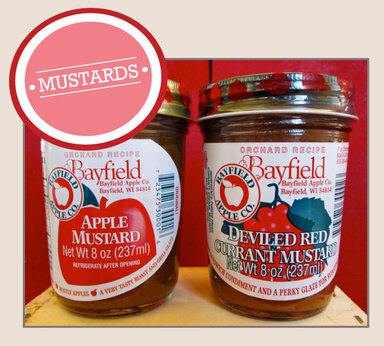 We make two varieties of mustard: Apple and Deviled Red Currant...YUM! 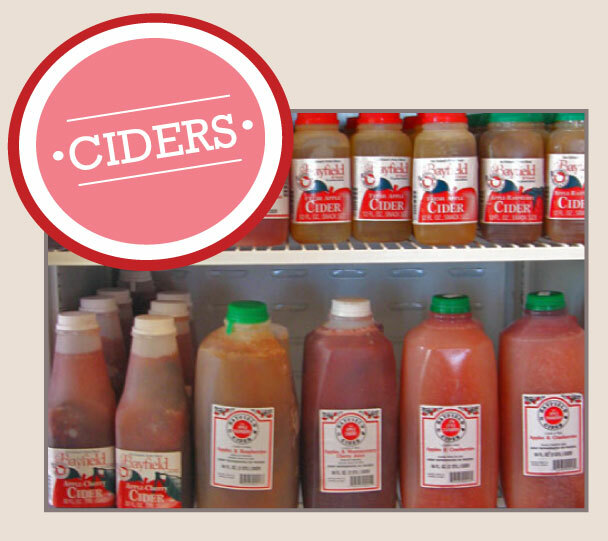 We make four varieties of cider: Fresh Apple, Apple-Cherry and, our newest variety...Apple-Cranberry. Each variety has a unique taste, but are all equally refreshing! Our cider is not just an autumn drink; it is a delicious treat, perfect for all seasons! 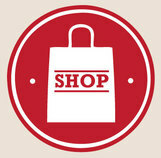 If you are interested in buying any of our products via mail order, press the SHOP icon below to be redirected to our shopping page. Here you can buy all the shippable products (jams, jellies, fruit butters, mustards and honey) that we currently have available. If you live in Wisconsin or Minnesota, check out OUR PARTNERS page to find a retailer that carries our products near you! If you have tried our products, and wish to carry them in your store, fill out your information on our CONTACT US page - we are always looking for new retailers to partner with!